Like all the other grifters in Conservatism, Inc., she changed her tune after Trump was elected. 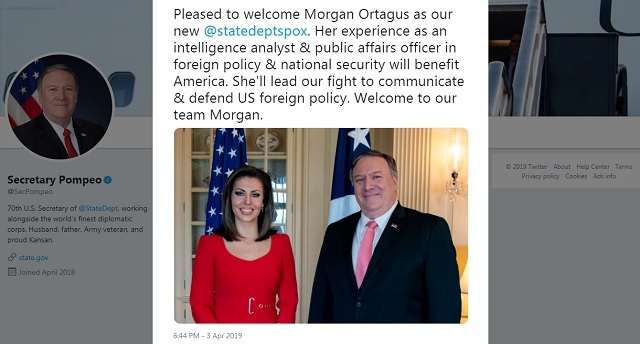 Now, Secretary of State Mike Pompeo wants to hire her at the State Department. "Quite frankly, I don't want someone with the temperament of a middle school pubescent boy in the president's office"
Former Fox News contributor Morgan Ortagus, the expected pick to become the next State Department spokesperson, repeatedly criticized President Donald Trump during the 2016 Republican presidential primary, a CNN review found. Ortagus publicly lambasted then-candidate Trump over what she called his "isolationist foreign policy approach," and blasted behavior she qualified as "disgusting" and "not serious." However, she quickly reinvented herself as a vocal Trump supporter after he secured the party's nomination and has remained a key TV surrogate for the administration over the last two years. [...] In an April 2016 appearance on Fox News, Ortagus, who was working for a super PAC associated with Trump's primary opponent former Florida Gov. Jeb Bush, said she had deep-seated problems with Trump's foreign policy approach despite agreeing with him on certain issues like Iran. Earlier that year, Ortagus had slammed Trump for mocking people with physical and mental disabilities and described his temperament as unsuitable for the Oval Office. "You have somebody who makes fun of people with mental and physical disabilities. That's disgusting; there's no other way around it," she said in January 2016. "Quite frankly, I don't want someone with the temperament of a middle school pubescent boy in the president's office," Ortagus added in the same radio interview. According to the New York Times, Ortagus was married to her husband Jonathan Weinberger by Ruth Bader Ginsburg in her chambers at the Supreme Court (you can see a picture here). Judging by Trump's past appointments, she'll fit right in.